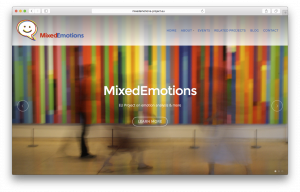 The MixedEmotions project aims at building an open source platform for emotion analysis across big data resources in multiple languages and modalities. The platform is developed around three pilot use cases with specific requirements for emotion analysis, in particular for: customer recommendation (Social TV), customer analytics (Brand Reputation Management), and customer monitoring (Call Centres). The MixedEmotions platform builds on a range of big data language, speech and A/V technologies as well as Linked Data technologies for semantic-level information integration. For more information please visit www.mixedemotions-project.eu. This project has received funding from the European Union’s Horizon 2020 research and innovation programme under grant agreement no. 644632.